An update on hybrid LED/laser projectors, and what lamp-free projectors could mean for you. Ask anybody who has to install projectors and keep them running about what they hate most about the job, and you’re likely to get an ear full of their fear and loathing of having to change lamps every year or two. It’s not only tedious and expensive, but for some out-of-the-way projectors, it can even be dangerous. The rude fact of life for conventional projectors is that their lamps burn out after approximately 3,000 hours of use, and start to dim even sooner than that. It’s inevitable; projector lamps eventually need to be replaced. At between $100 and $500, the cost of bulbs alone can dwarf the original cost of the projector after only a few years. Innovative organizations like RelampIt (www.relampit.com) can help defray costs by offering “e-cycling.” RelampIt offers a service that takes your original projector lamp assembly, uses the OEM housing and replaces the spent bulb with a new one. The company says that relamping saves 30-50% off of the cost of a new original manufacturer lamp, without compromising performance. Then there is the potential of the lamp-less projector. This product replaces a traditional high-pressure bulb in favor of semiconductor illumination engines that never need to be replaced. Regardless of whether they are powered by lasers, LEDs, or a hybrid of the two, the era of projector bulb appears to be nearing the end of its reign. On top of doing away with the hazardous mercury that’s in conventional projector lamps, these next-gen projectors take a new approach to creating a projector’s beam. They not only run cooler and use less electricity but can reduce maintenance to nearly zero. After a slow start, these devices are improving to the point where they are now ready for a variety of business, educational and theatrical uses. Projectors that don’t use lamps come in all shapes and sizes these days. In addition to their early use in ultraportable projectors, there are now models for mainstream, boardroom, large-venue and even rear-projection devices. Here’s how these projectors work without lamps and how this technology can change the way you do your job. Most projectors have a conventional high-pressure lamp that creates a wide spectrum of light from a glowing filament bathed in an inert gas inside a sealed quartz tube. No bigger than your thumb, a standard projector bulb puts out an enormous amount of light, but needs to warm up and can take a few minutes to get to full brightness. The lamp consumes a lot of electricity and produces a lot of heat. Every projector requires a fan or two while some larger projectors are cooled in other ways to prevent a meltdown. “If that isn’t bad enough,” said Rich McPherson, Product Manager of Projectors for NEC Display Solutions of America, “after a couple thousand hours of use, the lamp burns out and needs to be replaced. For those projectors in plain sight, it’s not a problem.” But, what about the projector in the auditorium that is hanging 75-feet above the audience? “It’s time to get out the ladder to change the bulb,” he added. Lamp-free illumination comes straight out of the physics lab. Rather than creating light from a hot filament, laser, LED, and hybrid lighting engines work by corralling and manipulating electrons below the surface and forcing them it to emit light at a certain frequency. They are made in cleanrooms similar to where memory and processors are manufactured. Since there’s nothing to wear out, they have rated lifetimes of at least 10,000 hours of use; some can go for as long as 100,000 hours. That adds up to a decade or more of expected use and is often longer than the life of the rest of the projector. “Essentially, the lighting element goes from being the shortest- to the longest-lasting part of the projector,” said Jim Gavloski, director of product management at Christie Digital Systems. The simplest illumination scheme is used on AXAA’s L1 V2 pico-projector. It has three individual lasers that create beams of red, blue and green light, which are bounced off of the projector’s Liquid Crystal on Silicon (LCoS) imaging chip. The reflected image then travels through lenses to the screen. Because it doesn’t have a bulky lamp with a filament that needs to warm up, the L1 V2 can get to its full brightness in a second or two. Plus, it’s about the size of a smartphone, weighs just five-ounces and can run on a battery. This makes it a good work tool for impromptu meetings or small group collaboration. The biggest beef with lamp-free projectors so far is their light output. For example, the L1 V2 puts out a mere 20 lumens, about the level of a flashlight. This should be plenty for a few employees to see the image with the lights off, but can’t cut it for bigger meetings in a lighted room. The increase in optical output is already underway. By combining lasers and LEDs, a hybrid illumination engine can compete with traditional lamps on brightness. Acer’s K520 mainstream projector and Casio’s boardroom-class XJH-1750 each use a similar set up to put a lot of light onto the screen. It starts with a blue laser, whose beam is bounced off of a phosphorescent disc that converts it into green light. This is augmented with banks of red and blue LEDs. All three beams are bounced off of the DLP imaging chip and onto an output lens. This LED-laser combo design can boost light output to 2,000-lumens for the K520 and up to 4,000-lumens for the XJH-1750. A big bonus is that rather than the red-blue-green color components coming from white light, they start as pure beams of each color. As a result, these devices can project images that deliver a wider range of colors. By contrast, Christie built its Entero family of rear-projection devices around LED illumination engines. There are separate banks of LEDs for the red, blue, and green light that travel through a condenser and on to the system’s DLP imaging chip. Because the three beams of light are separate and can be individually controlled, no color wheel is needed to create red, blue, and green light. It can deliver up to 1,100-lumens of light to a rear projection screen, but the use of banks of LEDs offers a major advantage: control. Like other professional projectors, Entero is calibrated at the factory, but it has a 12-bit processor that monitors each LED’s output to not only insure consistent and uniform illumination but that its color balance is spot on. It allows the system’s color temperature to be minutely adjusted to between a color temperature of 3,200- to 9,300 Kelvins to suit the viewing environment and use. With a projected life of 80,000 hours, it is the long-distance champ for projectors and should be virtually maintenance free for its life. That’s more than 9-years of 24-7 continuous use. “No other technology can even come close to this level of longevity,” adds Christie’s Gavloski. Sony’s VPL-FHZ55 is a pure laser design that results in a complicated optical path. The large venue projector’s illumination engine has a single high-output blue laser source whose light is divided into three separate beams. The first is allowed to pass through directly to the first of three 0.76-inch 1,920 by 1,080 LCD panels. The other two beams are converted into green and red light and sent to their own LCD panels. The final image with all three-color components is put together in a special cubic prism and sent to the projector’s output lens and on to the screen. This arrangement can produce up to 4,000 lumens and fill up to a 50-foot screen in an auditorium, small theatre or lecture hall. This illumination technology is impressive and improving, but it remains costly. Alternatives to traditional projector lamps are still priced at a premium, but they cost less to operate over time and can pay for themselves. Take Acer’s K520 as an example. At $1,200, it is priced several hundred dollars over a comparable mainstream projector. Rated to last for 20,000 hours of use, though, it can run for 12.5-years if it is used for 8-hours every business day. Ignoring the cost of electricity and getting someone to change the bulb, it can cut expenses by about $1,800 on lamps alone over this projected life. Net savings: $600. This is just the start. Over time, as this technology matures it should get less expensive than bulb-based projectors. Think of it as akin to the falling price of computer memory. With time and Moore’s law at its disposal, memory chips have gone from one of the most expensive parts of a computer to one of the cheapest. The same thing can happen with lampless projectors, but don’t hold your breath. It will take years, if not a decade to accomplish. In other words, don’t put that ladder away quite yet. Brian Nadel is a NY-based technology writer and former editor of Mobile Computing & Communications. A Class D training simulator using Barco projection to recreate the nuances of an Airbus A320 cockpit. The idea is to exactly mimic the cockpit, right down to the controls and what the crew would see on a trip. 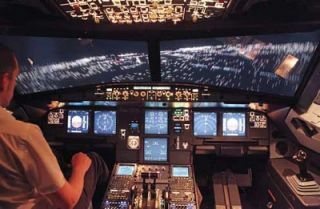 The more realistic the simulator, the better the training is so that when something odd happens at 30,000 feet, it isn’t a surprise. This includes being locked inside for the equivalent of an 11-hour flight from Heathrow to Hong Kong International Airport. Housed in a large white box, the simulator is balanced on a series of hydraulic rams that deliver the feel of banking to the right or the vibrations from turbulence. Key to keeping up the simulator’s airborne illusion is its three Barco FL35 projectors that put out 2,560 by 1,600 resolution or roughly 4-million imaging pixels each. The 200- by 40-degree panorama composite image of what the pilot would see through the plane’s six windows shows everything from the tarmac below on take-off to the stars above for an overnight flight. The simulator is balanced on hydraulic rams, and offers an exact replica of an airplane cockpit. Rather than a high-pressure lamp, inside each of the simulator’s FL35 projectors is a trio of LED banks for red, blue and green beams of light that are shined onto a DLP imaging chip. The use of LEDs means that the simulator’s projectors put out as close to a constant light level as is possible and extremely consistent colors, which makes blending the edges of two adjacent projected images easier. How can I monitor and control energy usage within my facility? AV Technology: The BYOD trend is growing, and there are security concerns as well as compatibility issues. What can technology managers do to help guide users without discouraging innovative and creative solutions? Extron: Extron studied this trend from the beginning, and developed two iPad apps that work as additional points of control for existing Extron technology within classrooms, boardrooms, other presentation environments. TouchLink for iPad and MediaLink for iPad emulate existing Extron control within these rooms, and provide fully-compatible, mobile solutions that work on any iPad. As far as security is concerned, iPads can be locked down with the Extron TLM 100T secure iPad mount. What options are there for controlling device power within AV racks? Some Extron controllers such as the IPCP 505 feature independently switched 12 VDC outputs which can power auxiliary products within racks and can also be configured and controlled using Extron Global Configurator software. Products such as our IPL T PC1 and IPL T PCS4 offer centralized power management for one or four AC outlets, respectively. This can be used to power down a product so that it does not continue to draw power even in standby. Many of our readers are helpdesk personnel that are tethered to workstations and can’t do remote, mobile troubleshooting. What would you suggest? Extron has a mobile AV resource management app, called iGVE, which is used in conjunction with GVE to effectively manage and control large-scale AV installations from Apple iPhone and iPod touch devices. iGVE has made a profound impact in freeing up technicians in helpdesk applications, where they would otherwise be tethered to a desktop or laptop computer. These projectors are larger and more powerful than mainstream devices, have roughly double the light output and can project large sharp images with the lights on. With the ability to fill a large screen, these projectors have interchangeable lenses so they can fill a large screen from across an auditorium or house of worship. By ditching the bulb, LED-based rear-projection devices can run for years without a lamp replacement, perfect for hiding in a wall for a 24/7 signage installation. This class of projector offers a very small and light package for quick meetings and impromptu presentations in nontraditional locations, but comes up dim. Permanently set up in classroom, lounge, or small boardroom, this class has enough brightness to give a presentation with the lights on.